Instagram. The app you used to love but now your not sure how to get people to see you? There have been so many algorithm changes lately with Instagram and Facebook it can feel like a never ending battle to understand them and what the changes mean for your business. 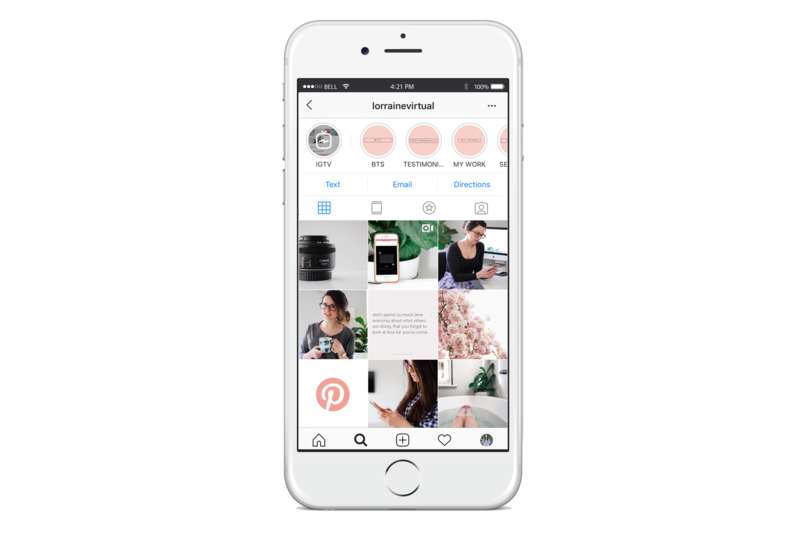 Today I thought I'd share my thoughts, a few tips to ensure your Instagram is being seen by your target audience and also a few amazing Instagram resources from other biz babes. What are the new Instagram Algorithm Changes (supposedly)? So what can you do to boost engagement and 'get around' the algorithm? To answer this question I thought I'd give you a quick run down of my own Instagram accounts. I have three - one for my handmade biz @littlemisslorraine, one for my sewing blog / vlog @jessicalorraine01 and one for my Virtual Assistant Services @lorrainevirtual. This is the account I've had for the longest but it is also the account that gets the least amount of engagement. Whilst we have a lot of genuine followers, we did a few loop giveaways back when they were a thing and so it means it wasn't organic growth. I cannot express how important organic growth is for your Instagram (you'll see why in a moment) Before the algorithm changes we averaged about 60 - 70 likes per post, now we average 35 - 40 and our average post reach is around 370. My newest account. I average about 35 - 40 likes per post with around 2 - 3 genuine (not spam) comments. Post reach on these is around 150. So really for the amount of followers I have this is pretty good. You can see how it compares to my @littlemisslorraine account which although we have 9 x the amount of followers gets the same amount of likes per post. Food for thought. My best performing account. This is the account where I get the most engagement and I believe this is because my following is truly organic (hence why I was stressing how important organic growth is above) I average between 200 - 400 likes per post with anywhere up to 30 - 40 comments, 10+ saves and an average post reach of 2500. I haven't seen any big changes with the engagement on this account after the algorithm changes either. Okay so what does this all mean? Here are my tips for boosting engagement & 'getting around' the algorithm. Be consistent. You don't have to post 3 - 4 times a day or even everyday, but start to be consistent with your posting schedule. I notice when I post consistently on all my accounts I see better engagement results. Engage. The big one and one I cannot stress enough. The Digital Picnic summed this up perfectly in a recent Instagram post when they said the reason people are seeing drops in their engagement is because they are not engaging back with their followers / other Instagram accounts. It is after all a 'social' platform. If people comment on your photos make sure you reply (the quicker the better) Spend some time each day commenting on other posts (Like I said above the short 'wow!' comments won't cut it unless you want to be seen as spam. Try and aim for a sentence at least) E N G A G E! Are you using Instagram Stories? If you are not I highly suggest you start using them. They have been tipped to become the next biggest thing in 2018 and are a fantastic way to boost engagement. I've got a great podcast listed in the resource section below from Mums with Hustle you need to check out. A lot of business have started the 'have you seen my post' Instagram stories. I get why they do this - to increase engagement as usually their stories are being seen by a larger number of followers than their actual Instagram post. I would however try and keep this to a minimum and only use it for posts you really want people to see (new products launch, new blog post etc.) I don't know about you but it annoys me when businesses do this for every post and I certainly don't click through. Want help with your socials? I have 3 management packages available to help you keep a consistent precense on Social Media. Cat and Cherie from The Digital Picnic have an amazing selection of social media workshops available. I have heard so many great reviews about them! Mackayla offers 1:1 social media coaching and has also created a free Facebook Group & eBook to help you get the most out of marketing on Instagram. Thanks for these tips Jess. I wasn’t aware of them myself. I also love Hashtag Authentic podcast. I always learn so much! So glad you have found them useful Mel! I’ve seen big changes since I’ve implemented these myself.